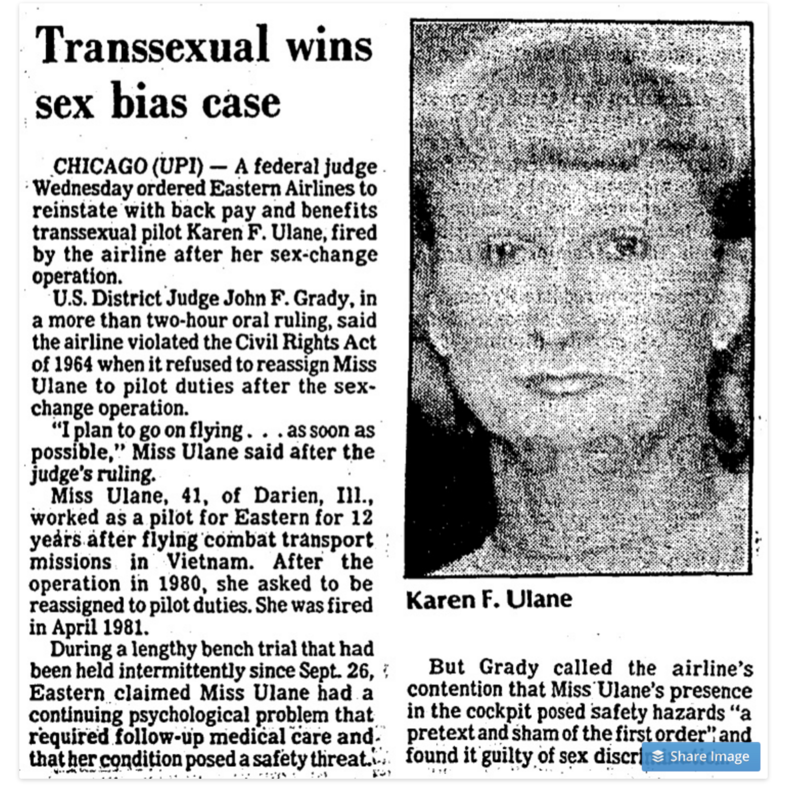 Karen Ulane was a aviator in the Vietnam War and a pilot for Eastern Airlines before she was fired for her gender transition. Photo: Transascity. With The Danish Girl opening across the country this Christmas, we’re going to hear people saying ‘There, you’ve had your trans movie, be happy.’ But there are so many more trans people whose lives would make amazing movies. Imagine the dramatic biopic one could make of One-Eyed Charley, a trans man who drove stagecoaches in the California Gold Rush in 1849. He earned fTame as a skilled and daring driver, even after he lost his eye to a wild horse. Lucy Hicks Anderson’s life would make a great romantic thriller. A black woman in the early 1900s, she bought land in California and ran a brothel with her husband. When her trans status was revealed when she was in her 60s, she and her husband were both arrested for fraud and sent to prison for several years. Even though she was sent to a male prison, they didn’t see each other again until their release. How’s that for a dramatic arc? There wouldn’t be a dry eye in the house. Karen Ulane was an Army aviator in the Vietnam War and later a pilot for Eastern Airlines before she was fired for her gender transition. She died in 1989, test-piloting a DC-3. She would be an incredible inspiration for the next Star Fleet captain, breaking new frontiers. Diego Sanchez, born 1957, has lived all over the world. He was only five years old when he came out to his parents as trans, and they raised him as the son he was. He grew up into a career in communications and PR, and then into politics. He was the first transgender person appointed to the Democratic National Committee’s Platform Committee, and the first openly transgender person to work as a senior legislative staff member on Capital Hill. A political movie about him would literally be a movie about how the world changes. Every one of these people’s stories is a story that could change people. It could be the key that lets a troubled child know they aren’t broken. It could be the weight that tips the scales of public opinion for the good of us all. These are important stories, and they all deserve to be told on screen, told by trans actors in trans voices.